Our Fall Stereographer Series continues and has a great list of the world's best stereographers and technicians. Our goal is to enlighten you about the modern stereographer, his/her role in major tentpole productions, new technology and expert advice for the up and coming new generation of 3D creators. Be sure to check out all our interviews right here. Next on tap for our series is stereographer James Goldman (OZ THE GREAT AND POWERFUL, PROMETHEUS, PIRATES OF THE CARRIBEAN: ON STRANGER TIDES) who is also responsible for the stereoscopic 3D in Ridley Scott's new epic EXODUS: GODS AND KINGS! This guy has his finger on the pulse of 3D and I am thrilled to have this chance to talk with him. EXODUS looks absolutely breathtaking. If you haven't seen the latest trailer - definitely check it out. Thanks for taking time to talk with me James - I know you are extremely busy. How about and easy one to start: What is your favorite 3D movie and why? James Goldman: Of course Jim, my pleasure. My favorite 3d film is Pina, the Wim Wenders film about Pina Bausch. I think that film really made a lot of people see what 3d was capable of. It took amazing spaces and filled them with objects and people to really utilize foreground, mid, and background. It played a lot with movement of foreground to background and vice versa. Not all narrative films can get away with that set up every time, but a dance film can. JG: I think the debate really boils down to money and time with the studios. If a movie has a hard release date in the near future and 3d is desired, then they shoot native because conversion adds a whole other element to the post work time needed. If time is of no concern, then it seems to fall to conversion. I have heard conflicting reports as to which is cheaper; I’m sure that has a huge part to do with the direction it goes. Very few filmmakers are up to shoot 3d because they have heard all these horror stories about the delays and how long it takes to change lenses and so on. Conversion has come a long away- Guardians of the Galaxy looked amazing in 3d compared to earlier films. JG: I respect Seamus McGarvey very much as a DP. His body of work speaks for itself. I know that his first experience with 3d was not a good one. He went out to test for Avengers with a camera crew that had never done 3d, a stereographer that was from the post side of things, and a package that was prepped in three days. I know this because I gave his camera crew some advice while I was prepping Prometheus in the next hallway at Panavision. I believe that, if prepped right, supported by a strong crew from camera, dit, and stereo, and given the proper tools, 3d can move almost as quickly and efficiently as a 2d film. I say almost because no matter how well prepared, you are always going to encounter issues. One rig has twice the issues as a 2d camera; that is simple math. We shot Prometheus and Exodus with five rigs in use almost constantly and in less than 90 days. I’ve worked on 2d films of the same scope that went much longer than 90 days. How to you position China now on the world cinema stage now that they have ~20,000 3D screens in place and growing? JG: China has a lot of people. Obviously those people want to see 3d, or the movie houses want them to see 3d. Only time will tell if that holds true. 3d made a big splash here a few years back and kind of slowed down. I know a lot of people hope it will take off over there for good. It can’t hurt 3d to have that much presence in the theatres. JG: I ended up in 3d by chance first, and by study, second. I had done Alice in Wonderland as a camera assistant and was very interested in how it all worked. On Pirates of the Caribbean 4, we shot in 3d and I just paid attention to what was happening around me. Dave Drzewiecki was great to me and showed me how everything worked, along with Dave West from Pace, the best rig tech at Pace, hands down. I took over Pirates 4 in London and that was that. I did a lot of testing for Prometheus to get more comfortable with what I was doing and then it just all figured itself out. It helped to have good people around. Steve Evans on Prometheus was my right hand and very helpful in all areas. JG: My preferred setup is the 3ality TS-5 with Red Epic or Dragon. We have used a lot of zooms on big rigs: Angenieux zooms from 15-40, 45-120, and everything in between. Super speed prime lenses for the steadicam rig. Fiber system is a must. A SIP (Stereo Image Processor) for each rig. Fairly standard. Every rig has its own cart, then all carts hub into my main A cart so myself, or someone else, can monitor all of them as a final check. JG: There is always something new, bigger and better. Until I have seen it used and worked in the field I don’t get very caught up in it. I’ve been most happy with the wireless setups that have become available for rig and video transmission in the last few years. Small, fast, and easy to use. JG: It definitely takes longer to make a lens change in 3d. On Exodus, we had it down to less than five minutes including setup of the rig. But that was because the stereo department and camera department worked very closely with one another. I was a camera assistant first and always try to think like that when setting up a rig. It is the camera crew that has to deal with it on a minute-by-minute basis. The more friendly the rigs are to everyone, the easier it is for everyone to help one another out when finding problems or changing configurations. JG: Not sure about that one. Every situation has a different approach and way to shoot it. I like to play with each shot and see what I can get out of it. I know this- my least favorite 3d shot is a tight over. JG: I think what sets me apart of a lot of stereographers is my approach to shooting. I like to be on set. I like to see what is going on when cameras are being set up. It’s easier to work hand in hand with the operators to get what you want then to deal with the director or the dp for little things like moving foreground or cheating things around the edges of frames. I find it easier to go to the director and dp with over all concerns, not every little thing. I have been very fortunate with Ridley and Dariusz because they both trust me to do what looks best and are very accepting of the 3d and willing to work with it, to a certain extent. JG: Pay attention to what others are doing. The best schooling you can get is watching films and other media to see what people are doing. A good shot will always be a good shot, 3d or not. Everything else is just practice. I started working in film because I really enjoy watching movies and was interested in how things were done. I still am. JG: I haven’t spent much time in post; none, actually. My good friend, Gareth Daley, who worked with me on Exodus and followed the film through post, swears by RV software. Gareth swears it is the best for viewing shots in 3d and all stereo analysis. He is one of the smartest guys I know and probably has more 3d experience than any other working in film. He did all The Hobbit films as head rig tech and worked on many other 3d projects. JG: More resolution could always be better in some ways. With more pixels you just begin to create larger files and, until the world is showing 4k in every theatre, it’s only truly beneficial for post and visual effects. It would allow you to crop in and reframe later, as well. I’m kind of old school and like my movies to look like film, crazy idea in this day and age, I know. I still feel like the crispier the image gets the more it looks like sports on TV. JG: The only real filter we use often is the quarter wave retarder. It helps to eliminate glare or polarization in one eye or both depending on the situation. When something is wet or painted with a sheen, it sometimes looks different in the reflected eye. If that can be fixed in camra and save the VFX houses from doing it than we try. JG: I’ve never seen anyone try the diopter thing in 3d, although it sounds interesting. Not sure if the eyes could take it. I’ve always wanted to the old Martin Scorsese trick where you dolly in and zoom out only instead of zoom replace it with IO and Convergence manipulation, make the world breathe and shift planes. JG: I think the biggest challenge in 3d today is making good 3d movies. Often, when I go and see a 3d movie, and I see them all, it lacks good overall 3d. It seems like the 3d is just an afterthought. Working with people and hearing stories, I know that sometimes it is just that. When people go to see 3d, that’s what they are paying to see. Thank god for Marvel because they have continued to put out big movies that a lot of people see and they have continued to try and keep the 3d as big as possible. Even though its post converted, they still work to get the depth in and I think it makes a big difference with the viewers. JG: I’m happy it’s still around. I’m not happy with things like 4DX. I’ve sat through a couple movies in that thing and it seems so gag orientated so far, much like the movie houses in the 1950’s that didn’t last. Thanks so much again for your time for this James! 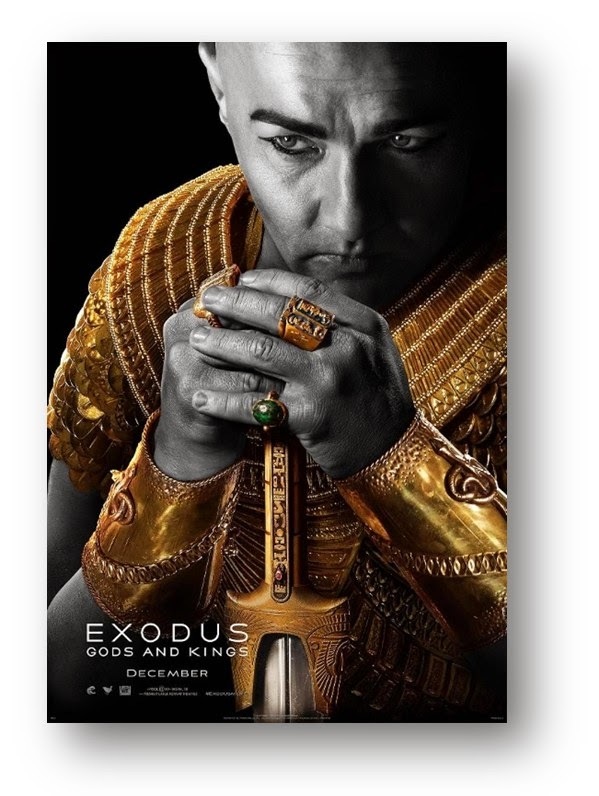 I'm sure I speak for everyone in wishing the best for EXODUS at the box office and critical acclaim. I can't wait for it!